I seriously can't believe that it's been more than a year since we started this blog ... time flies! Some of our first posts were actually Valentine's Day manis, so it's really exciting to post some new (and improved) designs this year. 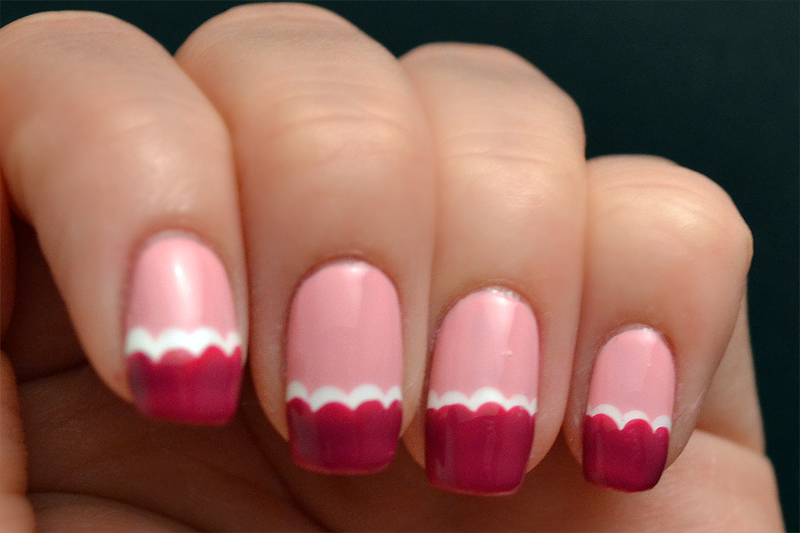 First up is a girly-girl pink scalloped edge nail art design. Pink is my favorite color, so I love all combinations of different shades. For my base, I used two coats of OPI Pink Friday. I had a couple rounds of trial and error before I could get the scalloped edge right, but I finally found a technique that mostly works for me. I'll probably fine-tune this a few more times before finding one that I love, but using my large dotting tool, I created a row of same-size dots across my nail. Originally I was putting them too close together and then painting the tips (an unnecessary step), which created an excess of polish that pooled and looked terrible. I picked a white polish that was thick enough to need just one coat, since I found that it was hard for me to have a steady enough hand to place the second coat exactly enough -- OPI Alpine Snow worked perfectly for this. Using the same size dotting tool, I layered my third color (a raspberry/fuscia Essie color -- I peeled the label off and can't remember which color it is!) on top of the white scallops and then quickly painted each tip to finish. Although I'm now married, I can definitely appreciate the anti-Valentine's sentiment surrounding the day. I decided to add a dark twist to Wendy's EKG heart mani from last year. Behold ... the flatline EKG. I started out with two coats of OPI Lucerne-tainly Look Marvelous, a dark microglitter that makes a mess when you take it off. I'm not sure how other people are doing their EKG lines, but I have a very unshaky hand when it comes to drawing straight lines. I used my pointed dotting tool to sketch out the lines ahead of time before using my striping brush. Before painting the white EKG line, I wanted to jazz up the bottom part of the mani. It's hard to tell in photos, but I used a matte polish -- one coat of China Glaze Stone Cold -- to create a contrast next to the shiny OPI polish. After drawing the EKG line with a white striping brush, I added a small red heart with China Glaze Ruby Pumps and a dotting tool. I used the pointed end of a dotting tool to poke "holes" in the heart ... all this did was create some dents rather than make a cracked look, but it definitely added some dimension.